For the past 2 years, since turning vegetarian, Shereen and I will go to a vegetarian restaurant to celebrate my birthday. This year was no different as we continued the tradition of a vegetarian birthday lunch for me, with a visit to the relatively new vegetarian eatery, Pita Pan. 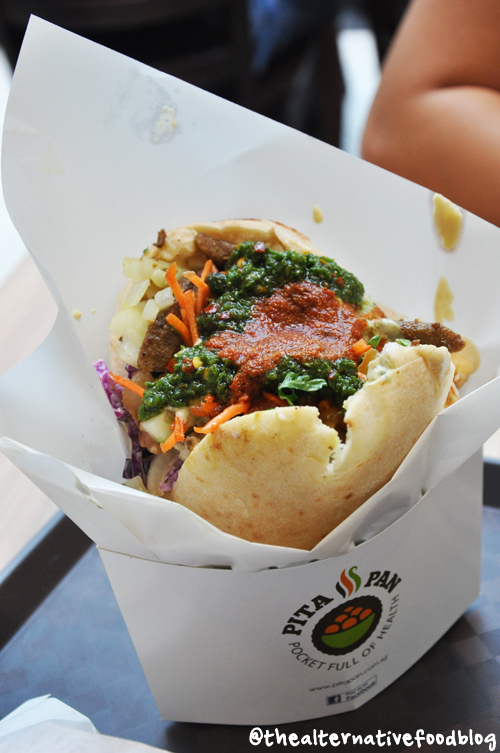 Pita Pan is strategically located at the entrance of Marina Square, close to the linkway to One Raffles Link. It is also right next to Manhattan Fish Market and opposite Lady M and Coffee Beanstro. 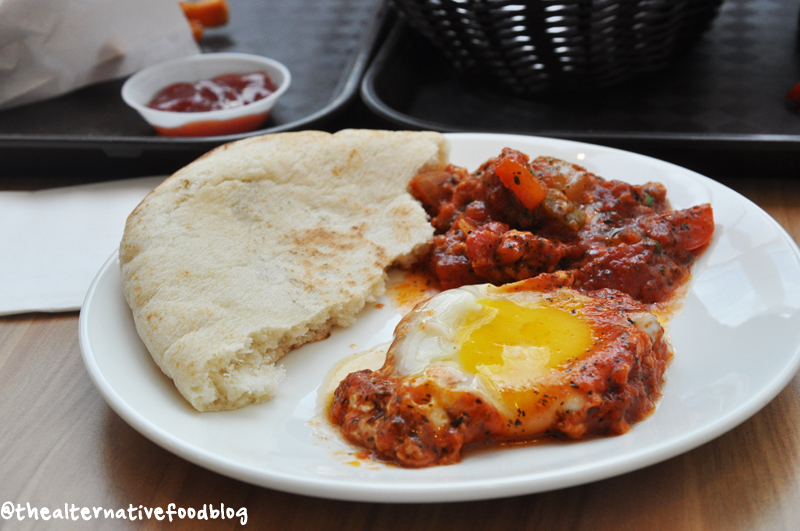 Pita Pan is a casual dining establishment, with an open-air concept within the shopping mall. The restaurant is brightly lit, and there are around 34 seats, along with bar seats and sofa seats to cater to different groups of diners. It operates like a fast food restaurant where there is a counter to place and pick up their orders. The counter has a semi-open salad bar that allows diners to inform the staff what type of vegetable fillings they want for their sandwiches and pita pockets. Since Pita Pan is a full-Vegetarian restaurant, I could order anything I wanted from the menu and I was spoiled for choice. Eventually, we decided on a Mediterranean Platter with Falafel, a Red Shakshuka, a Veggie Shawarma (full pocket) meal with Ice Lemon Tea, a side of Sweet Potato Fries, and an Ice Coffee. We were given an electronic token to take back to our tables that would notify us when our food was ready. We started our lunch with a side of Sweet Potato Fries (SGD $7.90) since it was the first thing Shereen collected. These sweet potato fries are coated with a thin and crispy batter, and fried to perfection in a similar fashion to how tempura would be prepared. 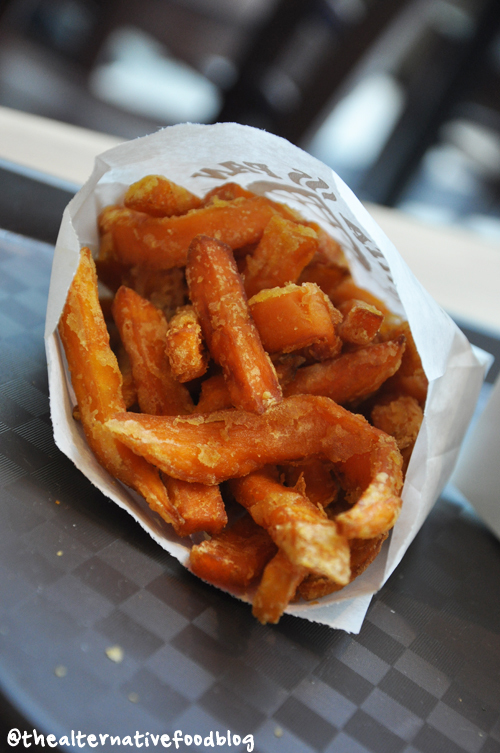 The fries are not salted, thus, its flavour comes from the rich and sweet taste of the potatoes. Unlike the usual french fries, these sweet potato fries are creamy and without the grainy texture. The Sweet Potato Fries were so good, we kept “stealing” pieces of fries while arranging the dishes for pictures! 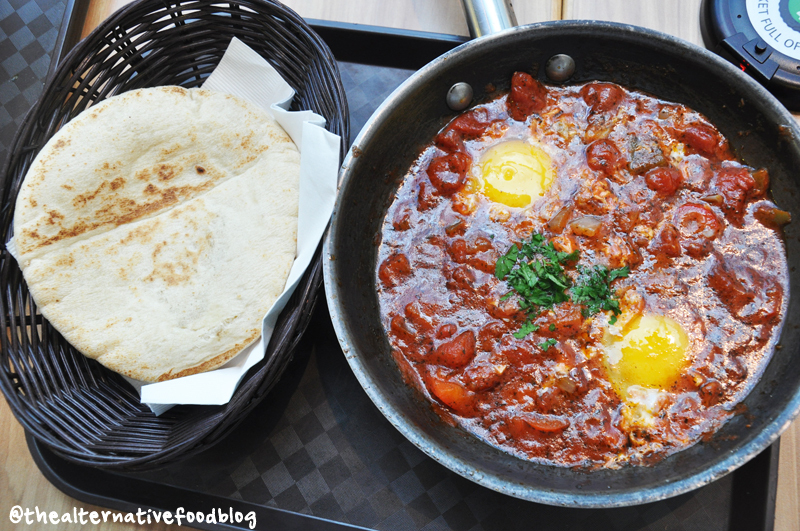 The next item we tried was the Red Shashuka (SGD $11.90) which is served with a helping of pita bread. Shereen had come across quite a few instagram posts that raved about the Red Shashuka and she was intrigued and wanted to taste it for herself. True enough, the shashuka was full of flavour with its tangy tomato base, herbs and spices seasoning. With non-vegetarian versions of this dish, it takes a lot of effort to ensure that shashuka is not burnt as it needs to be baked for some time to ensure that the meat (if any) in the dish is cooked well and at the same time, the eggs that are cracked on top are done over-easy. 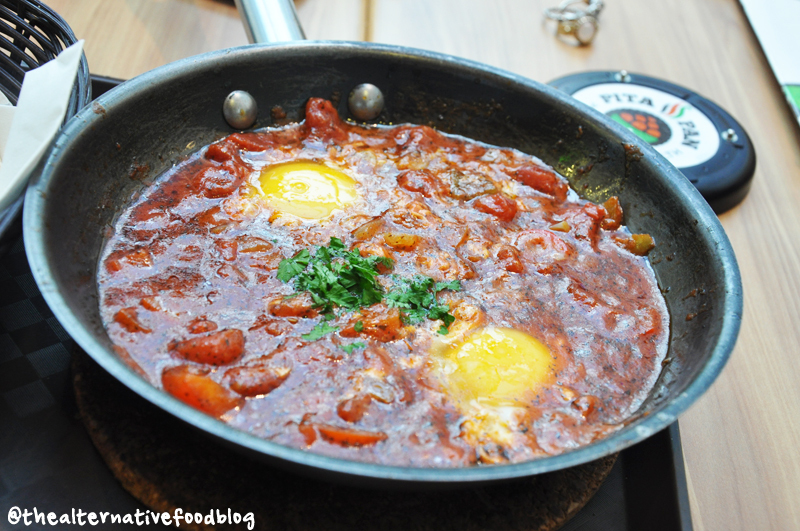 This Red Shashuka was well done, and the runny egg yolks added another layer of texture and taste to the dish. While I liked my runny egg yolks, Shereen would have preferred the egg to be cooked just a tad bit longer. The bread is fragrant, fluffy, soft and definitely baked to perfection. When dipped into the sauce, it soaks up all the goodness of the sauce and along with the runny egg, it made the dish a satisfying one. After we devoured the shashuka, we shared the Veggie Shawarma – a pita pocket stuffed with assorted salads and a serving of mock meat for me. 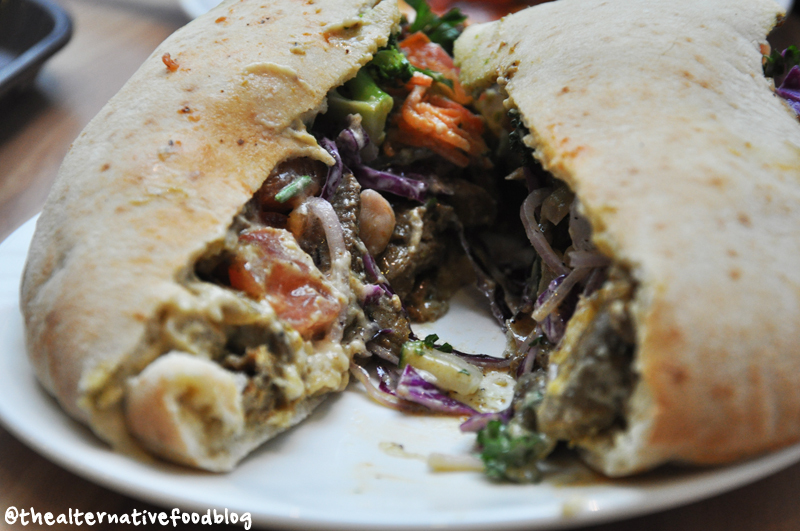 The mock meat is made with beans and is Pita Pan’s original creation. According to the service staff, there is no limit to the choice of fillings to the pita pocket as long as they can be stuffed into the bread. We also chose three sauces namely garlic tahini, green and red chili sauce to go with our shawarma. The chili sauce is spicier than we had expected and was reminiscent of a spice palette that is closer to that of spices used in Indian cuisine than Mediterranean. The serving of assorted vegetables, tomatoes, and beans provided a healthy balance to the shawarma. As for the mock meat, I find them to be very different from the gluten mock meat used in Chinese Vegetarian food. The mock meat created by Pita Pan was chewy and almost like a softer and more moist version of jerky. Because of the spices used to season the beans mixture, the mock meat is slightly salty, but it is balanced by the other fresh ingredients in the shawarma. The Veggie Shawarma was so delicious that we failed to notice that they had missed out our side of french fries that was supposed to come with the meal. Since we were there during lunch hour, and there was a reasonable crowd, we surmised that the staff could have overlooked our order. 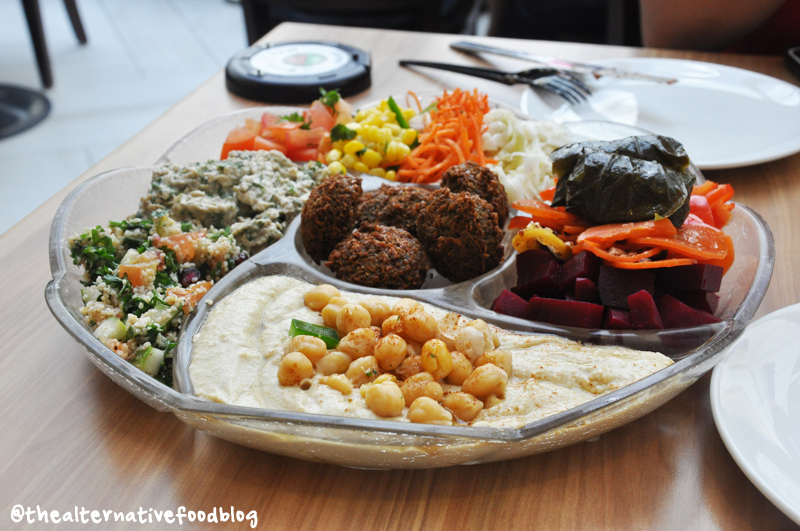 The last item we ordered at Pita Pan was the massive Mediterranean Platter with Falafel (SGD $26.90). The serving is extremely generous and can be easily shared by a group of four. 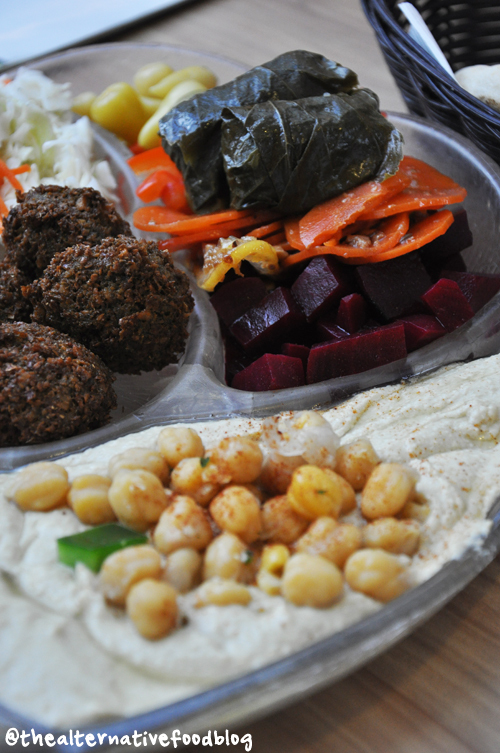 The platter comes with servings of coleslaw, fresh capsicums, carrots, pickled vegetables and olives, hummus with chickpeas, two types of couscous salads, dolma, falafels, and pita bread. The coleslaw tasted slightly different that the ones we usually get with western food as it is tossed with lesser mayonnaise, and there are spices used to flavour the coleslaw. As for the pickled vegetables and olives, they are not overly sour and has a tinge of sweetness in them, especially so for the pickled beets. The dolma is a stuffed vegetable dish, usually made with grape leaves. The dolma at Pita Pan comes with a sweet rice and pine nut filling that is well seasoned with herbs and I thought I detected a hint of cinnamon. It reminded Shereen of the traditional Chinese ba zhang but of course, this was meatless. The couscous salads -one with hummus and one without -were fragrant, though I preferred the couscous salad that is tossed with cucumber and parsley to the one tossed in garlic hummus. The lighter couscous salad was refreshing and went well with the pickled vegetables. As for the falafels, they were fried to golden perfection, crispy on the outside and moist on the inside. 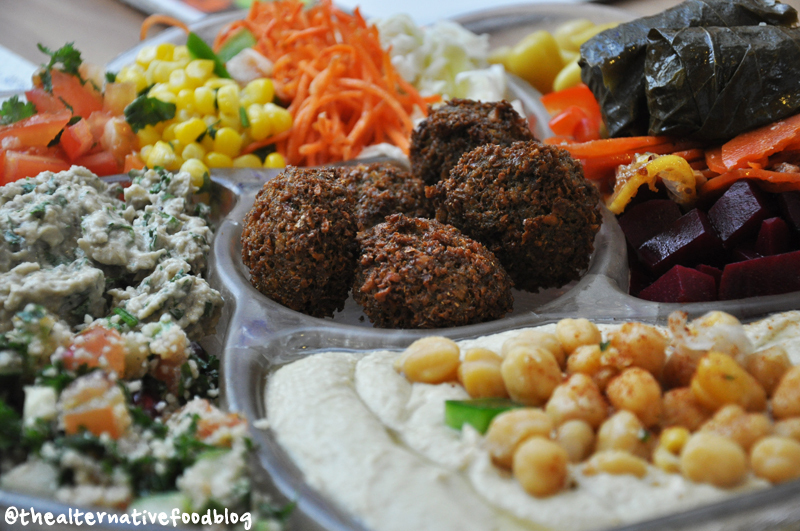 In fact, these falafels are better than those I tasted at Deli Moroccan. 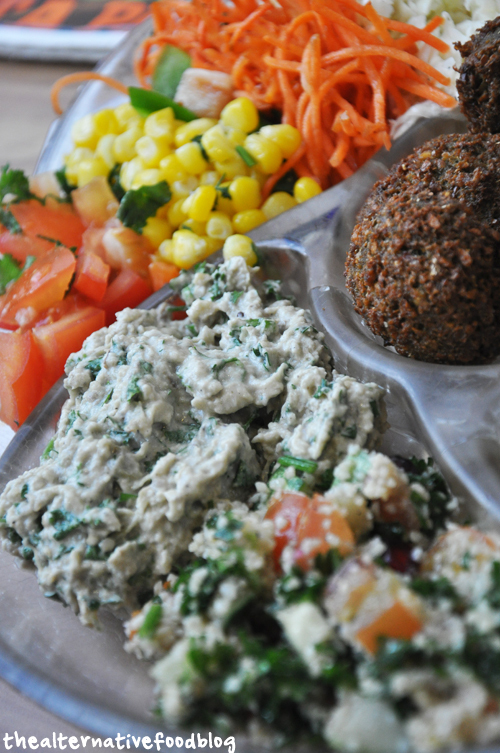 Combined, the different servings of sides and hummus went well with the pita bread, making this a wholesome dish that can be shared with the family or friends. Since we were stuffed from the different dishes we tried, we had to ask one of the staff to pack our leftovers for us. I was pleasantly surprised to find that the container used to pack takeaways (and in our case, leftovers) are designed to keep each condiment and sides separate. The presentation and thoughtfulness are definitely a plus for me. We washed down our meal with Iced Lemon Tea and Iced Coffee. Shereen’s Ice Tea tasted like your run of the mill iced lemon tea while I was disappointed with my Iced Coffee as the coffee to condensed milk ratio was not what I was used to. Additionally, the use of condensed milk also makes the beverage extremely sweet and too overwhelming for me. Perhaps, I should have ordered a juice to go with my meal. Vegetarian Options: Full-Vegetarian. Do check with them if you do not take onions or garlic as some sauces contain garlic. Note that they serve alcoholic beverages on the drinks menu.